The world's first GPU to support AMD FirePro™ SDI-Link, the AMD FirePro™ V7900 SDI professional graphics card provides powerful 2D and 3D acceleration for live broadcast and real-time professional video production environments. With 1280 stream processors,2GB of GDDR5 memory and support for industry standard APIs,such as OpenCL. 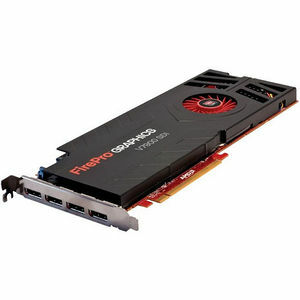 1.1 and OpenGL 4.2, the AMD FirePro™ V7900 SDI professional graphics card ushers in a new era of advanced GPU functionality and is a critical component for AMD FirePro™. SDI-Link-powered solutions.